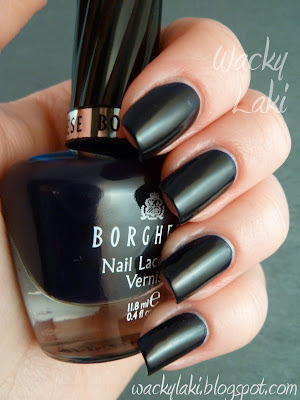 So yesterday I wore Mezzanotte Blue from Borghese. Was toying with the idea of doing something red, white and blue for memorial day, but decided to play it safe for work. Mezzanotte Blue is a blackened navy blue. This is just about the only type of blue that looks good on me (or maybe I'm just not used to wearing other blues...). The bottle color is beautiful, however, the color on the nail comes darker than the bottle color. Indoors it looks black 99% of the time. I applied three thin coats even though it was opaque after two. I added the third one to even things out and topped it off with a top coat. I wished that I had taken a picture when I had just one coat on because then you can really see the blue, so I swatched it on a color wheel. You can see it starts out a pretty navy blue, but by coat #2 it is practically black! Here it is outside, still really dark. Can you see the blue in the bottle? What do you guys think of this color? Thanks for reading my little ramblings! Ran out of acetone?! Oh no! i've never tried any polishes from this brand because none of them ever stuck out to me, but this is so beautiful! it looks great on you, it would be so pretty in the falltime :) nice blog!